Go-ped Quality, Made in the USA! 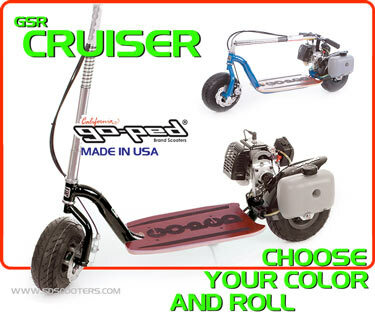 Looking for a quiet and super economical scooter then look no further the gsr cruiser is the best all around goped made and an excellent value. Based on the best features of all the previous gsr models and powered by the new economical gpl290 2.5hp engine this scooter is definitely the perfect first scooter. It has the strongest frame design in the industry and race proven mad dog brakes for excellent stopping power. Additionally there is a huge list of aftermarket parts available for this scooter for anyone wanting to customize their new gsr cruiser. Simplicity at its best and easily the most upgrade able and highest quality scooter made by any scooter company we cant say enough to recommend this scooter. Choose the Gsr Cruiser it is the best overall scooter value on the market today! Everyone loves the gsr cruiser, its easy to start and nearly maintenance free. If we had to choose a scooter for someone who had never owned one this would be our choice. Its super easy to use, quite addictive actually, and with its powerful little engine gas mileage is estimated at an incredible 100mpg. Imagine filling your tank for under $2 and riding for days. 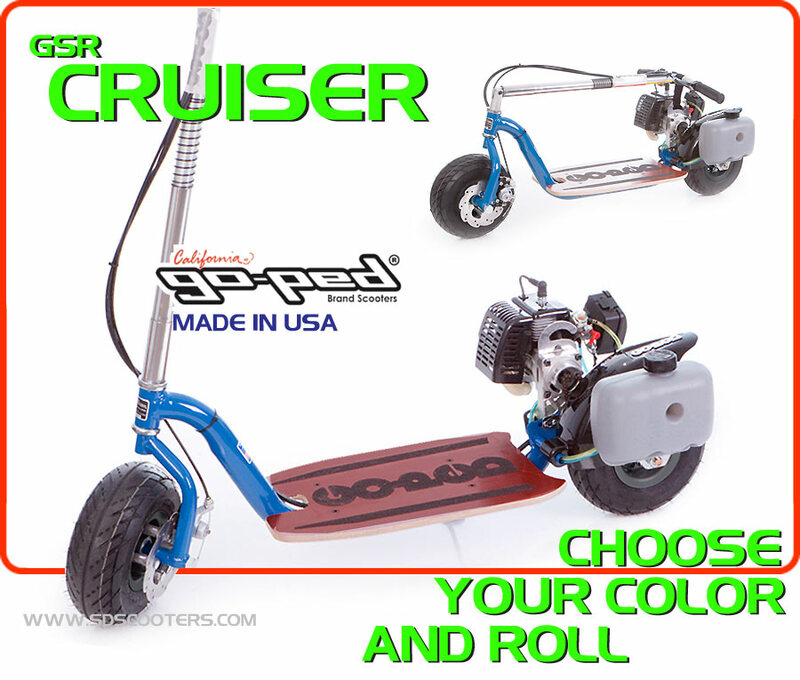 With the GSR Cruiser its definitely possible and we are certain your going to love this scooter, Its powerful engine, super strong frame and ease of maintenance make it a great addition to your family.